Beautiful Greek baptismal dresses in three colors, ivory, white or dusty pink -white, with amazing lace details in the bust. The final touch is the satin belt decorated with a bouquet of fabric flowers and the crochet flower headband. 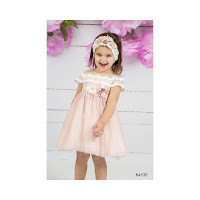 https://www.preciousandpretty.com/2018/05/lace-greek-baptism-gown-K4135.html Greek Wedding Favors|Orthodox Crowns|Stefana|Baptism Invitations Lace Greek baptism gown K4135 Greek baptismal dresses, with amazing lace, fabric flowers and crochet headband. Product #: Greek Wedding Favors|Orthodox Crowns|Stefana|Baptism Invitations_8298805904763152454 5 stars out of 5 reviews.